Reinforced concrete (RC) columns play an important role in the seismic behavior and in the efficiency of the structural system of reinforced concrete buildings to withstand an earthquake excitation. Considering the column under lateral sway, the moment-shear relationship in the span of a cantilever RC column under horizontal loading is identical to that occurring over the length of the actual frame member extending from the inflection point at midheight (this is the point of zero moment, zero curvature) to the fixed end support. The structural engineer starting from the capacity curve of a cantilever reinforced concrete column is able to obtain the capacity curve through pushover analysis of the whole building that is designed according to obsolete codes which do not include the capacity design concept. The columns could be also shear critical first because the transverse reinforcement is inadequate (a usual result of the application of the old-type seismic design) but also due to the column’s aspect ratio (the ratio of the height of the column’s section to the column’s length). The procedure to be followed for the acquisition of the pushover curve is that first the columns of each floor are considered a system of springs in parallel and therefore the capacity curve of the floor is obtained from each single column capacity curve. Then the floors of the frame of the building are considered as a system of springs in series and therefore from the capacity curve of each floor, the capacity curve of the whole critical frame of the building is obtained. The comparison of the resulting capacity curve with the Acceleration-Displacement Response Spectrum (ADRS) of the adopted seismic code permits the structural engineer to assess rapidly and efficiently the seismic vulnerability of the reinforced concrete building under study. The peculiar characteristics of shear-critical reinforced concrete columns are the outcome of the shear – flexure interaction mechanism but also of the important contribution in the final column’s lateral displacement, of the pull-out of the inadequate anchorage of the tensile longitudinal reinforcing bars of the column (a common point in old-type reinforced concrete columns). Therefore, nowadays it has become very important for the structural engineer to be able to define the contributions of all the above mentioned mechanisms of the structural column response all the way until column collapse. 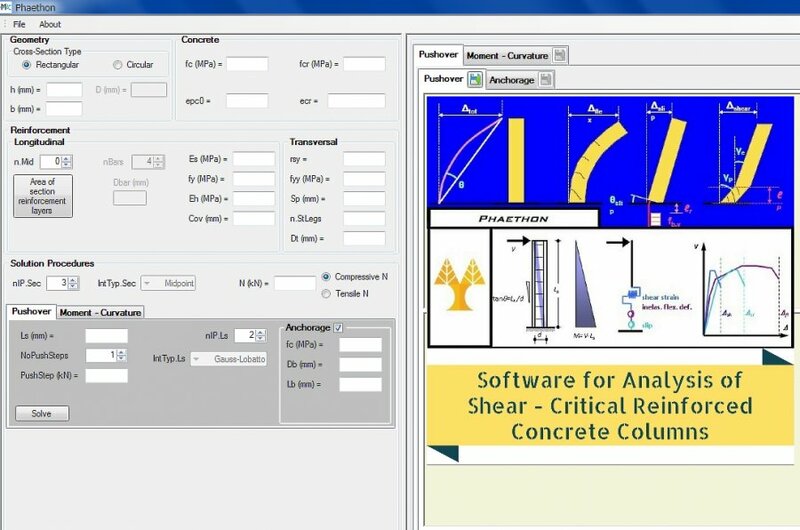 The stand-alone Windows program Phaethon© with user’s interface written in C++ programming language code offers this exactly possibility to its user both for rectangular but also for circular reinforced concrete columns. Moreover, the moment curvature but also the shear force – shear strain analysis of the sections of these columns is also possible, all based on the Modified Compression Field Theory. 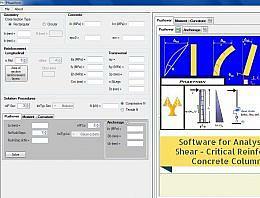 * Phaethon download link provides free for non-commercial use version of the software. Phaethon has been rated 5.0 out of 5 points. A total of 1 votes cast and 0 users reviewed the software.